I went to the three yard sales down my street. I found two nice gifts for my husband and hurried the kids to the car. I didn't drive away fast enough. I'm usually disciplined about walking away from sales, but I knew I would regret not buying this old quilt for $20. It has some wear and fading, but no holes. The colors are so perfect with the house--orangey red, bright yellow, a dark loden green. (The photo's colors are off.) My mom has a beautiful fruitwood display rack in her shed. Any quilters here recognize the pattern? Did I overpay? 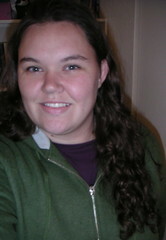 Meredith, I hope I don't post this twice. I think the first one got lost. If you get two posts from me dump one. Your quilt buy was fantastic. The pattern was often called Tulip in a Basket. It was used a lot in late 1800's. I am not an expert. Sometimes this flower was done with out the basket. The Pennsylvannia Dutch used it alot. The colors are classic. I think you have a real treasure! And click on the "Read a charming story..." link and you'll see an antique version. One of the things that make your quilt stand out a little more than the typical block is that you have different color "petals". I would love to see more photos. Is the red faded at all? If not, it could be that they used turkey red. At one point red was about 9 cents a yard, but turkey red was 27 cents. How's the hand quilting on it? Take a tape measure and count the stitches in one inch (how many times you see the thread "dotting" the top, not the actualy up and down count). If there's 7 or more, you've got GREAT stitching quality! 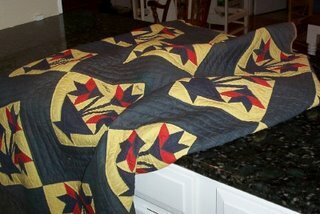 Antique handmade quilts will easily run into the $100s. You could try taking it to a quilt show and getting it appraised for about $20. If it's really a valueable quilt, then you might want to consider insuring it - which the appraisal will prove that it's worth something. Here is a link to a listing of dozens of quilt blocks. Unfortunately I don't see yours on it but it is the best resource I found during a quick search looking for your quilt name. I see that you have been given many names for this quilt, that is common! My mother-in-law made this quilt block in a quilt with a slightly different layout and the block itself was called "Amish Lily". I would suggest that you find the make you like the most for this block and use that! The strong and dark colors make me think that Amish Lily would be appropriate. I cannot see the quilting detail on this one, but even if it is completely machine stitched $20 is a steal. Assuming it would fit a full size bed, and was assembled by a quilter, not machine, I would suggest that if it is machine quilted it would easily resell for at least $400. If it is hand stitched, over $1000. Old quilts are a yard sale blessing. In any other market you would pay and arm and a leg, if a family was willing to part with them at all. My husband comes from a quilting family, and if you would suggest they sell a quilt they would look at you as if you suggested you sell your child, but happily make quilts for others. I just bought material for a full size quilt for my daughter, and the material alone was about $200, this does not include thread, batts, or time. Barbara Brackman's Blockbase lists the pattern as Basket of Lilies or Basket of Tulips...but the infuriatingly delightful thing about block names is that they change over time. The pattern was documented by the Ladies's Arts Company as early as their 1895 catalogue, so the pattern has been around forever. That said, the odds of this being a genuine antique are rather low, for two reasons: collectors have been sniffing out the genuine antiques for years; reproduction fabric and block patterns are readily available. Regardless of whether it is an antique, you did get a great deal. The object is to enjoy it! I agree with the Amish Lily title, I saw this pattern produced frequently by my Amish family. I think for them it was a bit ornate but still allowable. I think we would all love to hear if it was machine or hand stitched, but like your other poster said, you have spent WAY less than if you had wanted to put a quilt together yourself so a steal no matter what. Could you go back to the seller and ask for some more information about the quilt? If it was handstitched it would be worth knowing. Good job as always, Meredith! The quilt is definitely old, if not antique. The fabric itself feels slightly crunchy, and there is a lot of fading on the edges and a general yellowing of the back. Probably enough to devalue it completely, but I think it adds to the decorative effect, anyway! It is hand-quilted with, as much as I can gather, 10 stitches per inch. I don't know how to tell if the blocks have been sewn by machine or not. It is signed (?) with someone's name in the center square. The strange thing is its size. Instead of the pattern going vertically, it goes the horizontal length of the quilt. Like perhaps it was made to be put on a trundle or daybed. It doesn't go the full length of a modern bed. I'm not a quilter, but I say it's a steal. A handmade quilt that brings beauty to your house is well worth $20. I would think you could easily sell it on E-bay or at a yard sale for at least $20, if not more. How lovely and truly serendipitous! Meredith, what IS the name in the center? I'm just kind of curious.